By the end of the War of the Austrian Succession, Louis XV had decided to reform his army to reduces expenses. By a decree dated March 10 1749, 18 French regiments and several foreign regiments had been disbanded. 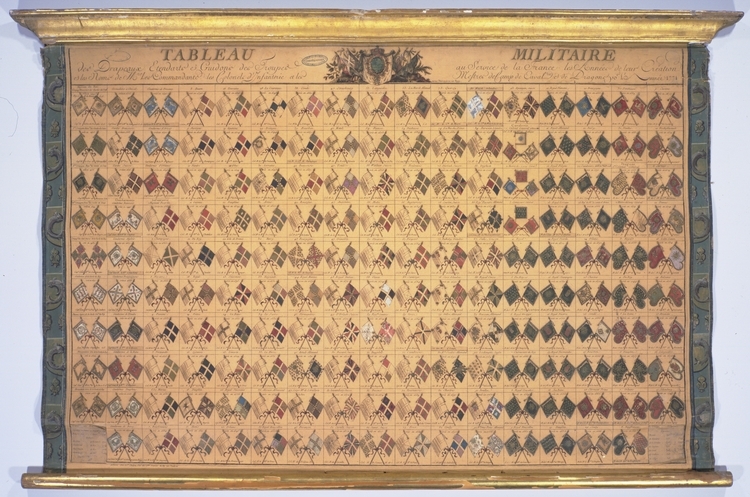 All battalions were reduced from 15 to 13 companies including a grenadier company and the number of colours carried by each battalion was reduced to a single one, the colonel colour being carried by the first fusilier company of the first battalion. The 42 grenadier companies of the disbanded regiments were amalgamated into a single regiment: the Grenadiers de France. On January 22 1751, the École Militaire (Military School) was created in Paris where 500 gentlemen's sons were educated, lodged and boarded at the expense of the state. N.B. : the number preceding the name of each regiment indicates its seniority ranking in 1758, it was never used as a numbering system to identify these regiments. Even though the Compagnies Franches de la Marine and Hallwyl both administratively belonged to the Navy, we have also listed them hereafter because they were in fact land units acting in conjunction with other French line infantry regiments. These troops were deployed in North America and in the West Indies. For more details, see our article on the deployment of the Troupes de la Marine during the Seven Years' War. Note: in 1760, the battalion d'Huart (10 coys of 77 men each) was created and sent to Martinique. Note: on June 3, 1762, a battalion (6 coys of 100 men each) was created at Blaye from regiments of Grenadiers Royaux stationed on the coasts and sent to Saint-Domingue. Anjou, Bourgogne Artois, Bretagne, Aquitaine or Provence were titles belonging to members of the Royal family: brothers, sons or grandsons of the king. To these titles were attached a House, a coat of arms, a livery, lands, revenues and regiments. These constituted the apanage (privileges) associated with the title. The ownership of these titles changed regularly, these frequent modifications were largely caused by the high infant death rate of these days, a reality from which even the Royal family was not spared. This in turn led to the complete re-arrangement of the complex pyramidal hierarchy of titles. Also, regiments were raised under the name of the Princes de Sang (princes of the blood) and often changed chefs. In some circumstances, such a regiment could be without owner for a certain period. In such a case, the regiment along with all the other privileges attached to the title returned to the crown, a clause in force since the testament of Louis VIII. However, even when temporarily attached to the crown with the king as mestre de camp, these regiments were still considered as Prince de sang regiments. The French army, in spite of attempts at making the system work, had a very obsolete logistical system by the standards of the time. The system had in fact not been changed since the reign of Louis XIV and there was a conservative tendency in the French army, preventing or minimizing change. The main problem was in fact the lack of a central commissariat. Recueil de toutes les Troupes qui forment les Armées françoises. Dessiné et illuminé d'après nature. À Nuremberg. chez Gabriel Nicol. Raspe. À. This page was last modified on 27 October 2018, at 14:10. This page has been accessed 158,029 times.